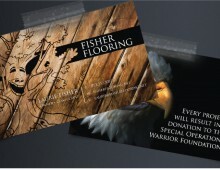 Laurie Fisher the the owner and consultant of Fisher Flooring wanted a logo and business card that expressed what she did as well as incorporated her fun personality and general love of life. The tree design is a very near and dear design to her and a lot of people in the area know her from it. She is a big supporter of the troops and wanted her clients to know that for every job, she donates a portion to the Wounded Warriors.